Please note that any Cancellation, no show or reduction in numbers of night on the booking , the fee not will refund it..
- If you need any other service, like airport pick-up, tours, city information, etc, just send us an email and we would be happy to solve your problems. Introducing you to a new way to discover the city, the perfect place for you to meet other travelers and a home-away-of-home experience. 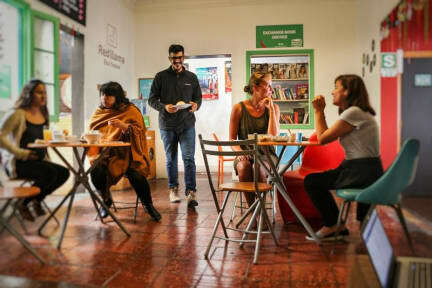 Red Llama is a relaxed hostel, found in a prime, inner city location - easily accessible from the airport. This backpacker base is in the heart of the city; in Miraflores, the ideal touristic destination next to city’s historical sights, main attractions, nightlife, restaurants, bars, shopping malls, and close to the famous Costa Verde Beach. We offer comfortable and clean facilities to budget-conscious travelers in a relaxed and friendly environment. I only stayed a few hours to get some sleep at the hostel However, what I can say is that is was pretty clean and the beds are comfortable A very nice location and nice staff! The location was perfect, everything was near by (restaurants, bars, shopping malls, ATMs) Great service, very friendly staff who helped me with lots of recommendations. The room was perfect for me. Good value for money. Definitely recommend it! Great, secure hostel. Kitchen facilities were a bit small but still contained everything. Overall good hostel and great location in Miraflores. When I was there the atmosphere was a bit dead, but could have been the dates I was staying. We stayed here for two nights after arriving in Peru, before traveling around the country, because they were able to let us check in at 2am after getting off our international flight. Location is very convenient in Miraflores, and the breakfast is actually pretty good (a little egg dish and a bread basket), with the option to order additional breakfast at a very low price. The biggest bummer was that there was little to no hot water in the shower. Hostel was clean and safe and in a great location. Lovely staff and good breakfast included. The rooms were too hot, didn’t even have a fan which meant window had to be left open onto a noisy street. Cold showers and no atmosphere. Kitchen wasn’t the best either. I was disapointed when I arrive, the place was under renovation, many hazard around my room (metal sheet in front of my door, Dry wall sheets etc), there where also painting in front of the building and blocking entrance door. I did not feel safe while under renovation, they should have close the area where work was being done to avoid injuries. My room was dirty I had to tell front desk to send someone to clean. Location is good. I will give it 4/10. Do not recommended this place.